Hitch a ride with Wine for Words, the Friends of the Library annual fundraiser! Enjoy wine & beer tasting, live music, a catered buffet dinner, silent & live auctions, and raffle drawings. 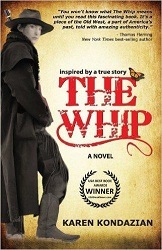 A special presentation by Karen Kondazian, author of The Whip, the acclaimed novel based on the amazing life of stagecoach driver Charley Parkhurst. Tickets are $50 each and seating is limited. Tickets may be purchased at the Placerville, Cameron Park, and El Dorado Hills libraries. Funds raised purchase materials for your local library. Sponsored by El Dorado Savings Bank, The Windfall, Spot-On Signs & Graphics, and Placerville Chapter Friends of the Library.